My first taste of life (and death) came in the form of a monarch butterfly. Inside three tiny, rectangular containers in my kindergarten class, I watched two monarchs undergo the process of metamorphosis, venturing from boldly striped caterpillars, to pupae, to glistening green chrysalis and — finally — to the orange-and-black butterflies we released out into the springtime air to meet their own fate. Today, wide-eyed children may not be afforded the opportunity to experience this kind of first-hand natural interaction, as monarchs — a butterfly staple of classrooms and outdoor education programs for decades — have recently been added to the United States Endangered Species “status review” list due to their declining numbers. The butterfly’s legions have steadily declined over the past 20 years, falling from one billion in the mid-1990s to only 35 million in 2014, due in large part to climate change and the use of systemic pesticides by major farming operations. While they have upped the production of soybeans and corn, these pesticides and new-wave farming practices have all but wiped out milkweed, the monarch’s natural food source. This differs from practices of yesteryear, which allowed room for native plants to thrive on the edge of farmland. “In the past, farmers would leave a swath of land on the fence rows where they would turn their machinery. Today, [farmers] can go fencerow-to-fencerow with crops, leaving nothing else standing. All you see through Indiana or Illinois are soybeans or corn. With this practice, you eliminate milkweed. It is 6,000 acres a day we’re losing, and you can imagine why the monarch is having such a hard time traveling through the United States,” says Kirby. Local gardeners have started to take small-scale action. Monarch waystations have been multiplying rapidly across the Midwest. In response, local gardeners have started to take small-scale action. Monarch waystations (specially built gardens that provide proper plants and conditions for monarchs to reproduce) have been multiplying rapidly across the Midwest, which has long been the trail through which the butterflies make their annual winter migration from Canada to Mexico. Kirby and Linda Porter (the Kentucky club’s special projects coordinator) have been evangelists for this movement, traveling across the region since 2013 in an effort to help individuals and organizations craft monarch waystations in their backyards. When they began in 2013, there were only 39 Monarch Watch Certified waystations in Kentucky. By January of 2015, 226 waystations had been constructed across the state, popping up in private gardens, schools, arboretums and even the Governor’s Mansion. If you’re looking for a holistic approach to growing a monarch-breeding hub, Linda “The Butterfly Lady” Porter’s seven tips for crafting your own monarch waystation offers a comprehensive guide. 1. Select a sunny location for your monarch waystation. All butterflies (and bees) love sun, and it makes it easier for them to spot the flowers. 2. Include at least three different varieties of milkweed* (Asclepias sp.) as host plants for monarchs. One female monarch will lay up to 500 eggs in different garden locations. For example, planting swamp milkweed (Asclepias incarnata) in wetter areas and butterfly milkweed (Asclepias tuberosa) in rock gardens will encourage the butterfly to lay more eggs. 3. Plant at least four different nectar perennials** in groupings, with three plants of each type represented. 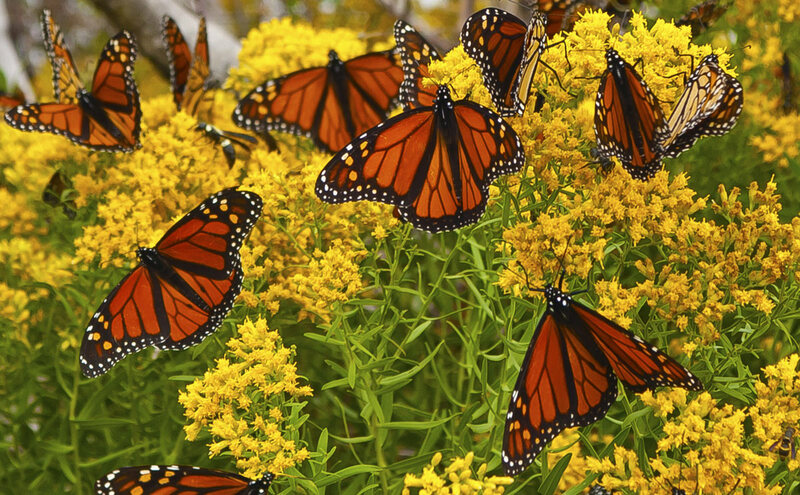 Monarchs (and other butterflies) love to sip nectar from pink, purple, orange and yellow flowers. The more colorful the flowers included, the more likely monarchs will be attracted to them. 4. Use native plants — such as coneflowers, asters and goldenrod — as part of your planting. Native plants (which will depend on one’s geographic location) are easiest to grow and maintain while attracting both monarchs and additional garden pollinators. Colorful annuals — such as sunflowers, cosmos, flat-headed zinnias and marigolds — are also ideal to include at a waystation. 5. Plant other host flowers for non-monarch butterfly caterpillars (such as a spicebush for the Spicebush Swallowtail butterfly, or parsley for the Black Swallowtail butterfly) in order to attract a diverse range of butterflies. 6. In your monarch waystation, never use systemic pesticides. This type of pesticide is taken into all parts of the plant and stored for long periods of time. Any monarch (or butterfly) caterpillar that eats the leaves of a treated plant will die. Instead, gardeners should use organic methods only to control pests in the garden. 7. It is perfectly acceptable (and, perhaps, encouraged) for your monarch waystation to be a little messy. If a garden plot is cleaned up too much or too often, it might accidentally lose a perfectly good caterpillar. Instead, leave your “end of season” plant debris in place until warmer weather to avoid killing the butterflies that cycle through the winter as chrysalis, eggs or butterflies in the clutter. AVOID: Tropical milkweed, which has been causing significant problems. 1. Pincushion Flower: These charmingly shaped, cool-colored flowers attract both butterflies and birds, and are perfect flowers to star in a monarch container garden. 2. Purple Coneflowers: A tall, cold-hardy flower, coneflowers derive their name from a peak center and enjoy the attention of bees and bugs alike. 3. Candytuft: Candytuft is a white, wooly, semi-evergreen shrub that thrives in rocky, sandy soil.